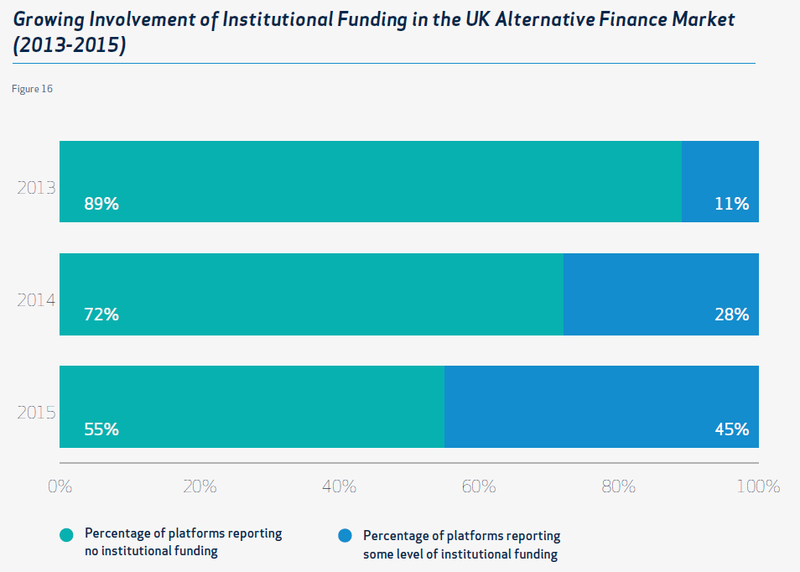 The report ‘Pushing Boundaries – The 2015 UK Alternative Finance Report‘ by Nesta and the University of Cambridge collected very interesting and comprehensive data on the market development by polling 94 marketplaces. 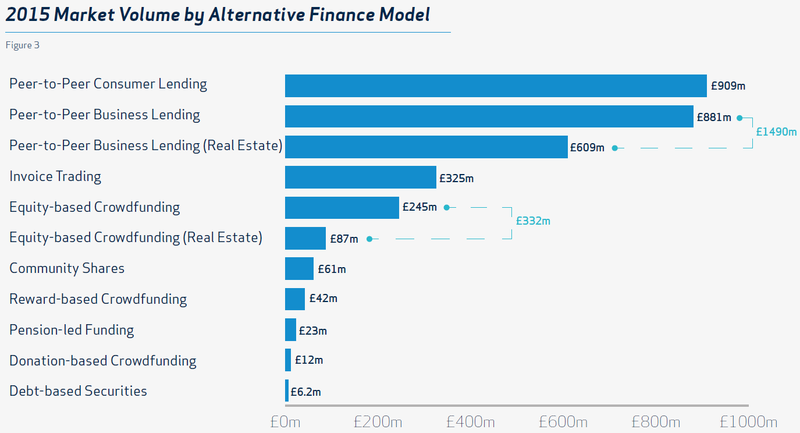 The report looks at alternative finance, including p2p lending, crowdfunding (equity/reward/donation-based), invoice trading, community shares, pension-led funding and debt-based securities. 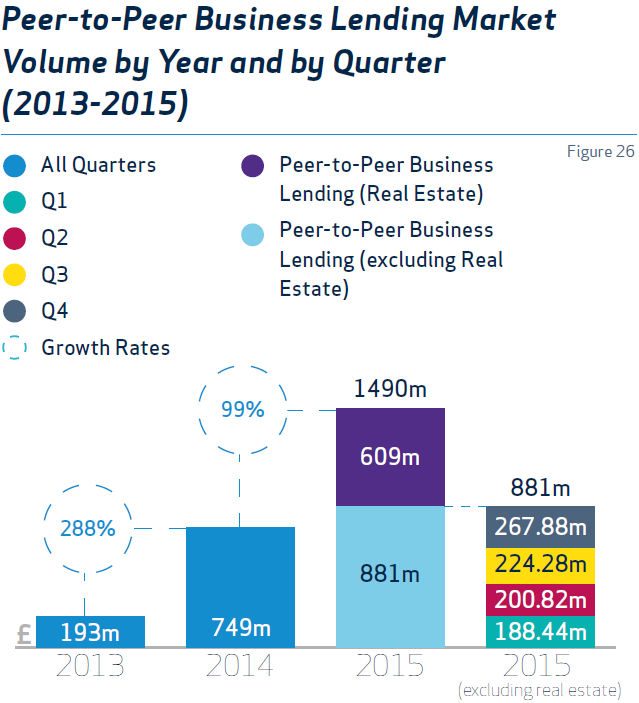 The total loan volume in 2015 was 909 million GBP, an increase of 66% compared to 2014. This is the sum of loans made to about 213,000 individual borrowers. A very high percentage (89%) of the investors used autoinvest features of the marketplaces to make the investments. 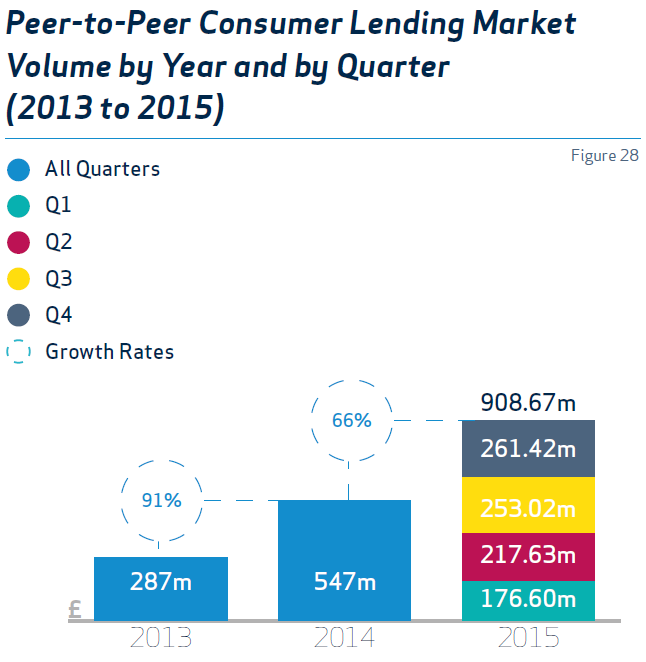 32% of p2p consumer lending was financed by institutional investors. This segment nearly doubled compared to the previous year to now 1.49 million GBP. An important factor are real estate related loans (609M GBP). There is a wide and partly complex range of loan types and terms. The non real estate related loans compromise about 10,000 loans to SMEs. In this sector 42% of investors use autoinvest functionalities. Depending on which data source is used for comparision p2p lending marketplaces in 2014 have gained a market share of 3.3% to 13.9% of all loans made to SMEs in the UK. The impact of institutional investors for the alternative finance sector in the UK has risen fast. While still far from the situation in the US it will likely replace the currently still dominating retail investors in the near future. 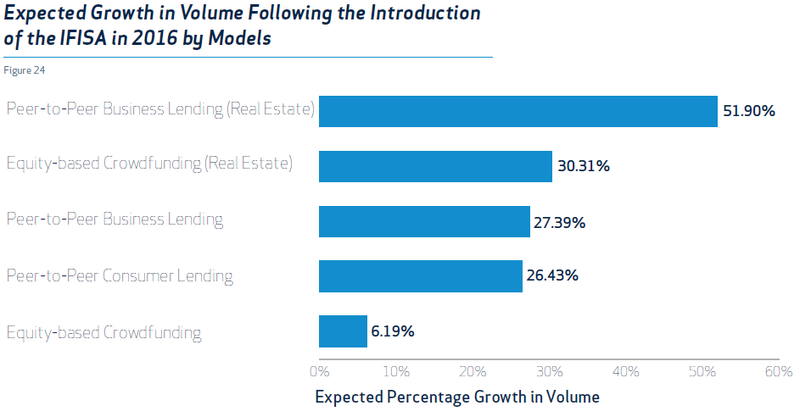 The report stats that about 1,000 institutional investors account for 32% of the loan volume to consumers and 22% of the loan volume to companies on the queried marketplaces. Institutional investors active include banks, mutual funds, hedge funds, pension funds, asset management companies as well as public and governmental funders such as local authorities and the British Business Bank. The british government as implemented new regulation for the sector and defined various tax incentives for investors. In 2016 the newInnovative Finance Financial Saving Accounts (IFISA) will start, that allow tax-free investing. The players expect a push in volume growth by the IF ISAs. Another factor contributing to growth, is that especially the equity based crowdfunding platforms benefit from an influx of money from foreign investors. This blog post only gives a glimpse overview on the wealth of useful data the study collected and processed. I highly recommend to read and download the full report below.